In 9 CE, as summer drew to a close on the Germanic frontier, Publius Quinctilius Varus, a Roman politician and general learned of a local uprising. 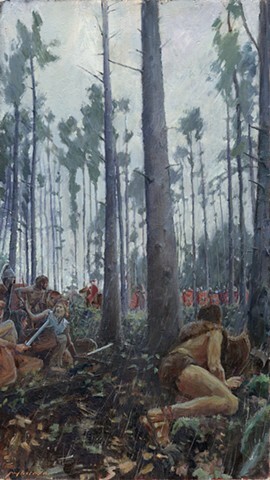 Responding to the threat, he marched three legions of regular soldiers, six cohorts of auxiliary troops, and three squadrons of cavalry into an unfamiliar, wooded territory. It later turned out that the rebellion was fabricated and Varus was being drawn into a trap. This scene depicts the moment when the trap was sprung. Amidst a heavy rain, a leading element of Varus' long marching column has suddenly realized that they have been ambushed. The Roman legionaries have begun scrambling to establish a line of defense as the enraged Germanic warriors rise to their feet and poise themselves for an all-out attack. After days of desperate fighting, Varus' forces were virtually surrounded and annihilated. Few Romans managed to escape. It is estimated that 15,000-20,000 Roman soldiers were killed. The Battle of Teutoburg Forest or "The Varian Disaster" as it came to be known, abruptly ended the period of triumphant Roman expansion that had followed the end of the civil wars forty years earlier.